Communication is the process of passing messages — ideas, information, beliefs — from one person to another person(s). This can take a multiplicity of forms including signals, gestures, speech, letters, telex, telephone, morse code, fax, television and radio. Communication is the name given to transport and travel facilities which enable people and goods to move from one place to another. We talk about ‘channels of communication’ when we discuss air travel or the proposed fixed rail link being constructed under the English Channel. It includes road, rail, air and sea transport. 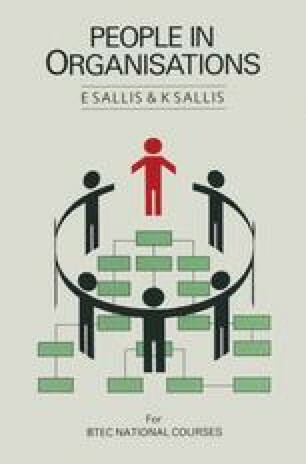 Communication in this sense is not a topic of discussion in this book, although it will form an element of your course in the Organisation in its Environment unit. Communication is a means of spreading news, ideas, propaganda, advertising and entertainment to large, often multi-national, audiences. The mass media embrace newspapers, books, magazines, radio, television, theatre, video and film. Communication of data via computerised and electronic means is a relatively new mode of communications but one which in the space of about thirty years has revolutionised the way in which we use, store and transmit information and data. It has opened up, via satellite and telecommunication links, sophisticated means of communication for a vast range of purposes including the control of spacecraft, weather forecasting and news transmission, and has provided us with vast and easily accessible data banks.